For the time being, you might have a great variety of bags in your closet, from sports bags to fashionable backpacks. They were “born” in a large factory with a great number of identical “siblings”. They are not unique ones, even cannot express yourself in a personalized way. 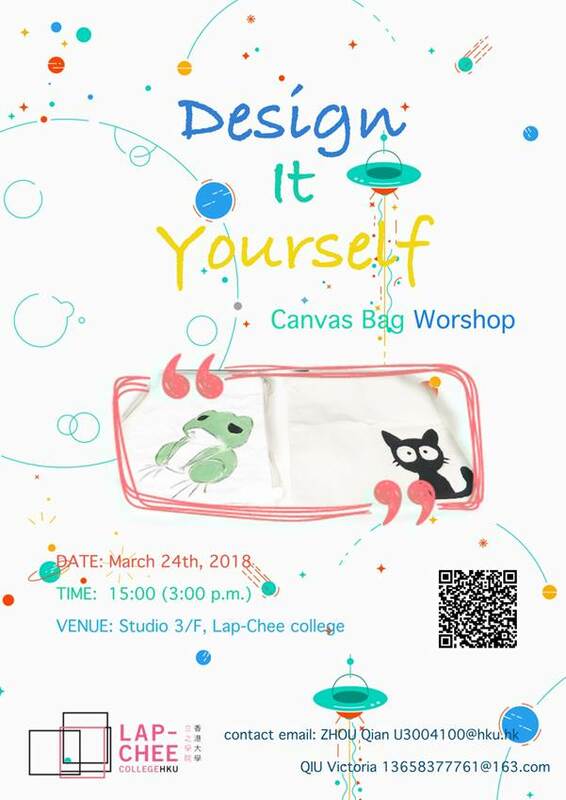 Why not design your own canvas bag with your imagination and creativity? It’s time to show what an outstanding person you are with your unique bag! Canvas bag is environmentally friendly and utilitarian, with great capacity to contain things and a little weight. Besides, it can match most of your dressing styles. To some degree, it is also quite durable, which could be used for quite a long time. Even though the fashion is changing over time, canvas bag is a second-to-none choice for you. Even if you like, the canvas could be passed down as a legacy. Necessary materials and tools will be provided. The only thing you need to bring with is your own mind. For enquiries, please send emails to Aimee u3004100@hku.hk or Victoria 13658377761@163.com.